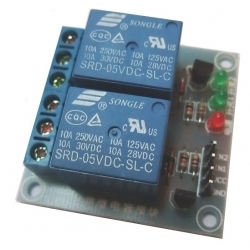 This small 2 Channel Relay Board works from a 5V supply for the relays and between 1V and 5V for the switching signal. It uses a transistor to switch the relay on so can be connected directly to a microcontroller pin. Supports any microcontroller or TTL signal. 3.3V and 5V supported. Easy 1 wire drive. High for on, low for off.